Cystic fibrosis (CF) is an inherited disease that causes glands throughout the body to make abnormally thick, sticky mucus. The most frequently affected organs include the lungs and pancreas. The intestines, liver, sweat glands, and reproductive organs also may be affected. CF is caused by two defective genes. A child inherits CF by inheriting one defective gene from each parent. Usually the parents do not have the disease but have a defective gene that can be passed on to the their children. These parents are called carriers. 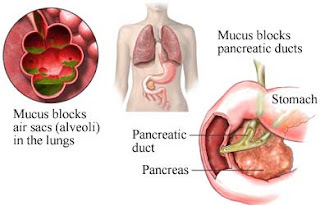 The abnormally thick mucus of CF blocks certain organs, causing many of the symptoms of CF. CF is a serious life-long condition that significantly reduces longevity and results in significant illness and ill-health for most affected individuals. Girls tend to be affected more severely than are boys. However, there is great variability in the severity of illness, and some persons with relatively mild forms of cystic fibrosis can live to age 60 or beyond. The doctor will ask about symptoms and medical history, and perform a physical exam. CF is suspected in a child with classic symptoms, especially if a sibling has CF. Researchers are exploring gene therapy to slow the progression of CF, or even cure it. If you have the defective genes, there is no way to prevent the development of CF. Adults can be tested to see if they carry the defective gene before having children. Prenatal testing can determine if a baby will have CF, but the availability of this testing raises many important ethical questions.